International Robotics Inc.: Robert Doornick’s robots do more than just compute—as the SAG-card-holding, first-class-flying Robot SICO can attest. Robert Doornick’s robots won’t walk up to you and say, “Greetings, human. Take me to your leader.” He avoids this predictable language and behavior, he says, preferring to use the element of surprise to get your attention and friendliness and humor to win your heart. Robot Millennia may well compliment your hair, tell you your eyes sparkle like diamonds, and ask you to dance. Most people, rather than retreating at the flirtatious behavior—as many would do with a human stranger—laugh and enjoy it when it comes from his robots. “That’s important whether you’re trying to entertain people, sell them a car or vacuum cleaner, educate them, or heal them,” Doornick says, and his robots are used for all of those purposes. 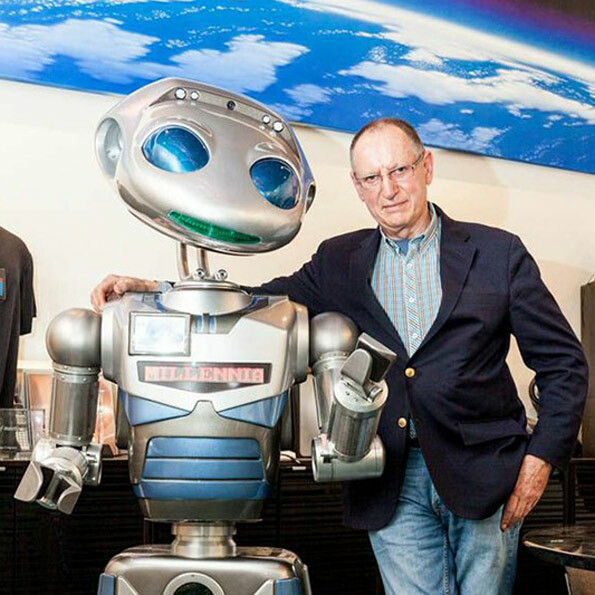 International Robotics Inc., Robert Doornick’s company, has its world headquarters in Larchmont. It can supply you with the latest in programmable friends and coworkers. If budgets are tight, the robots can be rented, but, if there’s a few hundred thousand dollars at your disposal, you can buy a SICO-series robot like Millennia and have him customized. Millennia, who was on the cover of a recent Hammacher Schlemmer catalog, is the first non-human actor to become a member of the Screen Actors Guild, under his stage name, Robot SICO. He has an extensive list of film and TV credits, including a role in the movie Rocky IV, which was written in specifically for him by Sylvester Stallone. The robot was a cast member for a season on the NBC soap Days of Our Lives, and appeared on an episode of MTV’s Punk’d with Hilary Swank. He entertained at a White House dinner in the Reagan administration, appeared at a comedy club, and hosted the Spanish Music Awards with an audience of 12 million viewers, among many other things. He travels first class on airplanes. He started his first company developing this sort of technology in 1968. “I demonstrated that those students could do extremely well, because I could motivate them to want to learn,” he says. International Robotics came to Larchmont, after 30 years in Manhattan, when the company needed more space. Doornick moved the company to a location near the French restaurant his family owned at the time, Pascal’s. He has a shop, a warehouse, and office space in Larchmont, and the production takes place in Michigan. He has representatives in France, the Middle East, India, and Asia. Robot Millennia recently met and reportedly delighted the ruler of Dubai, Sheikh Mohammed, the king and queen of Jordan, and many other dignitaries. Mr. Doornick, could you tell us about your background in developing robots and how you decided to get involved in the technology industry? My parents owned several highly successful nightclubs in Paris in the 1940s and 1950s. Although I was too young to see the shows, I was used to being surrounded by entertainers. My parents befriended major celebrities like Elvis Presley and Charlie Chaplin. Charles Aznavour got his start at my father’s nightclub. The experience made me comfortable going onstage without too many butterflies. As a youngster, I devoured books in science and technology, psychology, and quantum physics. I remember seeing a cartoon of a giant robot who’d been created by an evil scientist. The cartoon robot wanted to hurt people. I decided that when I grew up, I’d make kinder robots—robots that help people. Naturally, adults around me would very quickly advise me to stop dreaming about science fiction and concentrate on becoming a doctor, bus driver, or other conventional career. Even back then, I wanted to understand people and the interaction between people and machines in order to program human-like behavior into the machines. As a child, I wasn’t a very cooperative student, and by today’s standards might have been diagnosed with Attention Deficit Disorder. Frankly, I was bored by school, and felt that my teachers didn’t understand that. I was fortunate to be raised by parents who gave my sister and me a wonderful life with lots of toys and wonderful adventures. My suspicion was that students who did not fare well in school were, on many occasions, simply not motivated and interested. When you observe a child in today’s world—each one exposed to so much information through tablets, computers, and smartphones—and tell them to just sit in a square room with a blackboard in front of them, many of these students end up having attention deficits. Unfortunately, many of them end up being medicated. I thought by creating technologies that were interactive, we could help alleviate this problem. In the late 1960s, I relocated to the United States from France and attended New York University, studying communication psychology, marketing, and computer programming. Studying psychology in particular gave me a way to better understand the human mind and how people relate to the world. I started my first technology company in 1968 and we demonstrated that students could do extremely well when we motivate them to learn. We built our first robot, using our showbiz and psychology expertise to shape how our robots should look and behave. We knew from the start that they needed to be extremely entertaining and bond easily with any age, social, ethnic and/or cultural group. Their physical appearance should evoke memories of comic books or cartoons for a less threatening experience. Rather than mirror the beady eyes, straight edges, and sharp features of bad guys, we designed our robots to be curvy, with large eyes and soft, likeable features, like Mickey Mouse. Short robots turned out to be unsuccessful, as people found them to be toy-like. Ours had to be tall, taller even than the average human, and intentionally a little intimidating as they enter a room. Their personalities had to then be imbued with sweetness, compassion, and respect. Finally, this approach crystallized into our overall corporate mission. 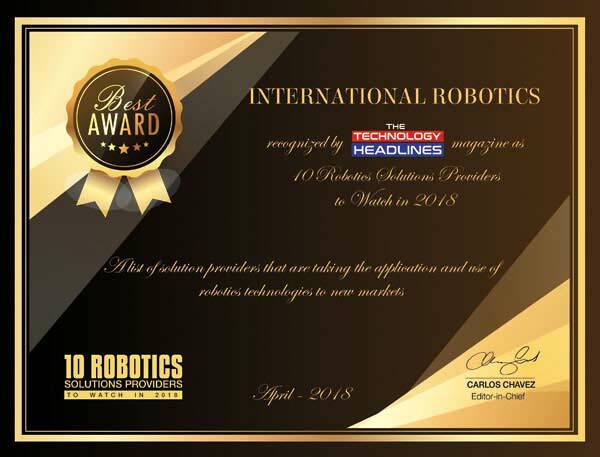 International Robotics is now a 40-year-old purpose-driven company, a pioneer of social robotics, and a global leader in communication robotics, producing adult-size robotic personalities that act as surrogate communications tools with learning-disabled, autistic, ADHD, handicapped, geriatric, and other special needs individuals. I understand that you have brought your adult-sized robots into schools, clinics, hospitals, rehabilitation and senior centers, and orphanages. Are there any experiences that are especially memorable? Here is another example. While visiting a senior center, I was told of a depressed lady who refused to leave her room and join in any activities. She had lost her husband, and the will to live. The robot came by her room and had a long conversation with her, sharing with her that he was very sad and lonely as he missed his family. He then invited her to be his date in the evening dance at the senior center. She asked the robot to leave and come back in 10 minutes. When he knocked on her door she appeared dressed in her best attire and had a shiny black purse on her arm. “I’m ready!” she exclaimed to the robot. They walked to the ballroom arm in arm. She stood on the robot’s platform, and they danced, and they danced…as a perfect gentleman, the robot walked her back to her room, and she thanked him for making her feel alive again. Finally, I would like to share the example of visiting a school for special needs children. The principal told me of a young child with a great many phobias who spent most of her school time in her office, afraid of noise, afraid of contact, afraid of crowded classrooms. I sat with the principal in her office, engaged in a conversation about this very cool toy robot and showing the principal that wonderful remote control that allowed one to control anything and everything. I could see from the corner of my eye that I had sparked her interest and without hesitation, I handed the controls to her, explaining that this device could give her tremendous control over this very cool toy robot. I invited her to play a game by taking a peek out of the principal’s office door and seeing the toy robot—safely far away down the hall. I had her press a number of buttons on the remote control and watch the robot’s head move up and down, raise and lower its arm, play a song, and spin. She began to feel empowered by the fact that she had total control of the situation. To make a long story short, this little girl eventually appeared on stage with me, to the envy of all the students, demonstrating to them the remote control and accepting a big round of applause. What have robots taught you about human psychology? We have delivered our services all over the world and to many diverse cultures. We see no significant differences in the success of the social robots and their ability to interact openly and freely with every age, ethnicity, or cultural group. This is an intriguing phenomenon, because if one was to study the socio-psychological customs and mannerisms of each individual culture without the help of the social robot, one would be prone to observe radically different behavioral patterns, often driven by local and deeply ingrained customs. 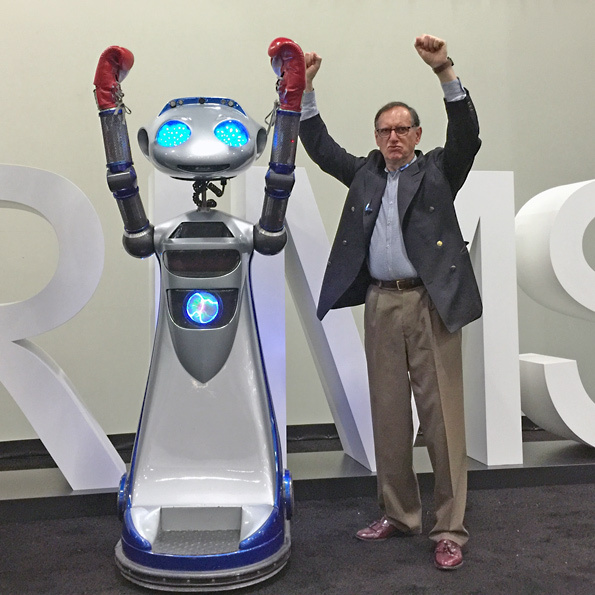 By contrast, the generic attributes of these communication robots, coupled with their intentionally created psychological makeup (candidly mimicking human idiosyncratic behavior), affords them the uncanny ability to circumvent the many constraints of social protocol such as judgment, fear, frustration, and so on. In the absence of these often restricting human traits, we see the rapid emergence of common denominators spanning across every culture in every age/social group. It is my firm belief that artificial intelligence alone will not suffice in order to guarantee a successful coexistence between humans and intelligent machines. While the human brain is wired to follow an infinite variety of complex rules when interacting with other human brains, it is far less concerned with those complexities than with judgment when interacting with technology. I have had conversations with NASA on the subject of extended space travel and other missions, suggesting that properly designed intelligent robots will permit crew members to take out their stress and frustration on such technological companions, which will greatly reduce friction and psychological conflicts among crew members. The world of technology is awakening to this reality. Already, makers of simple industrial robots are adding video screen facial expressions and personality to their simple pick-and-place assembly line machines. This is the beginning of greatly reducing monotony and boredom among human factory workers. As an entrepreneur, how do you strike a balance between doing projects that you want to do and projects that you have to do to pay the bills? That is a dilemma that many businesses must contend with. As a purpose-driven company, we are extremely fortunate to have found the perfect balance between our mission and our financial survival. The two are intimately intertwined, which I explain below. The Business End (i.e., how we pay the bills): We support our work by providing these robotic personalities to leading corporations, governments, and agencies who leverage this unique communication psychology into a number of corporate social responsibility/marketing/PR/sales and branding strategies. Those funds are reinvested into donating our services to special needs groups, and to often facilitate these clients/sponsors deriving all the publicity benefits. This is only normal since they are the ones who make this entire system function. We seek no reward or acknowledgement for what we do; only the opportunity to “do.” It makes perfect sense for our sponsor/clients to get much of the credit. Without them, all of these activities would cease. Tell us about the personalities of each of your robots. Do you find that each of them have a specific character trait that identifies them? Does this start during the design process? Giving birth to a new science such as robot-to-people behavioral psychology proved to be a challenging task. One could not take a course or pick up a series of books on the subject. A lot of research, careful thinking and experimentation went into creating today’s winning formula, encompassing architecture, scale, aesthetics, and design philosophy. I would give most of the credit to the modern-day Sigmund Freud of my formative years, Jean Piaget, a Swiss-born clinical psychologist known for his pioneering work in child development. Piaget’s theory of cognitive development and epistemological view are together called “genetic epistemology.” I devoured his teachings and attended lectures. Piaget had a profound influence on me and the direction which I took in launching my original company, aimed at the field of special education, providing teachers and other professionals in that field with novel diagnostic, prescriptive, and remedial interactive tools which permitted students and patients to work independently and progress at their own pace, with less fear, embarrassment, discomfort or defense mechanisms. This approach also permitted a single classroom teacher to give special attention to individual students while still catering to the needs of an entire classroom. The considerable success obtained with these interactive tools validated Piaget’s belief regarding the development of cognitive skills. It also made me embark on a campaign to help identify children diagnosed with ADD as often being simply the product of our modern information age by demonstrating that a number of these children demonstrated an affinity for extended concentration, motivation and strong learning performance through engagement with interactive tools. This background in psychology informed the careful design of these robots’ appearances, and which explains their being successful and welcomed in all facets of life (e.g., meeting dignitaries, receiving special credentials such as membership in the Screen Actors Guild, their own personal credit cards, etc.). Regarding personality, the psychological makeup of the robot does not vary between each model, adhering instead to strict rules of engagement, mannerisms, and behavioral patterns that are taught extensively to our carefully selected robot animators. First and foremost, and in order to successfully relate to their audience, the robots speak in a very human non-synthesized voice rather than a more predictable electronically created robotic voice. Secondly, and in order to supply a touch of humor, the character of the robot can best be described as “polite irreverence.” They candidly offer their own unique point of view from the mind of a machine, sometimes employing humorous vocabulary. Above all, they are respectful of humans, admirers and supporters, often dispensing complimentary comments. The robot is equally at ease bonding with a group of construction workers in the streets of New York, delivering an inspiring talk to students at a school or university, welcoming royalty, co-hosting a talk show, announcing the weather report on national television, delivering a keynote address alongside a chief executive officer, or simply “shooting the breeze.” Indeed, the International Robotics social robots provide society with an excellent dress rehearsal for a successful cohabitation between intelligent machines and human beings. What advice do you have for other aspiring roboticists? Do not create and invent just because you can. Think carefully and find new solutions that will benefit humankind and your planet. With the exponential rate of growth of science and technology, this century is about to experience the equivalent of 20,000 years of evolution! The brain of a young child in school presently contains as much information as that of a 40-year-old adult only a couple of decades ago. Unprecedented in the history of our civilization, the world’s largest corporations today are started by young students while still in school and with barely any funding, working in basements and garages. We are entering an era where anything and everything is possible. It is also possible that our relationship with science and technology as we know it today is simply a brief learning phase, perhaps leading us to the discovery of the very DNA of our universe. Already we are learning to grow technology organically, to replace artificial limbs by simply regrowing failed body parts, to program our brains to repair ourselves, to print materials, tools, cars, homes, and even food, to wirelessly transmit electricity across the world to those in need, to inexpensively desalinate ocean water so that underdeveloped countries may grow healthy, to develop vertical farming so that nutrient-rich food may be readily accessible without waste, to overcome the gravitational pull of the planet, and on and on.